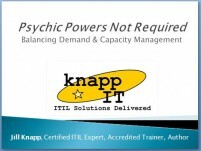 ITIL 4 « Knapp I.T. Flippin’ the IV: November 2018, Washington DC. Axelos ITIL 4 Foundation Train the Trainer SessionHi, all! I was lucky enough to be invited to attend Axelos’ ITIL 4 Train the Trainer session in Washington DC in November 2018. Hundreds of instructors applied to attend, and only about 100 were actually accepted across a few sessions worldwide. I feel . . .
It’s been a while since I’ve updated this blog, but there hasn’t really been much going on to report… until now! A few months ago at the itSMF Fusion 2017 conference this past November, Axelos announced that ITIL will be updated in 2018. (Watch a video of the announcement here!) This is great news, because as an . . .
→ Click to Read More of this Post: Have you heard the news? ITIL 4 is on the way in 2019!